In the Personal Project, the act of learning the process of putting together a major project is just as important as your final product. The information on this page will help you go through the steps necessary to understand the ideas that go into develop the personal project, to find an idea for your project, and to make a plan of action to successfully plan and complete your process for your project. Within the MYP Program, Global Contexts are used to help students direct inquiry - or build and explore questions - to help them focus their ideas and build learning. Global Contexts are broad categories of human interaction and relationships, within which all different types of learning, questioning and action can be defined. What do I want to achieve through my Personal Project? What do I want others to understand through my work? What impact do I want my project to have? How can a specific context give greater purpose to my project? The IB Approaches to Learning (ATL) skills are categories of skills that we strive to develop as learners. These skills – in areas such as communication, research and management – help us not only in the Personal Project or in our academic subjects, but in all aspects of our lives. As you are setting goals, you will reflect on the ATL skills, thinking about the skills that you have, areas where you struggle, and skills you’d like to develop. You’ll revisit the ATL skills later in your project, when you’re reflecting on your project and planning your presentation, to evaluate how you used the skills you have and how you developed others. Some ATL skills are listed below, for you to reference as needed throughout the project. The Global Contexts help to provide some categories of ideas that can help to direct your thoughts and develop ideas for your Personal Project. In order for the project to have any real meaning for you, it must involve something you're interested in. This is an opportunity to explore something about which you are truly passionate. Your project needs to have a clear focus, such as a question to answer, a challenge to meet or a problem to solve. Whatever your project, you will need to research - research the background of your topic, look for resources to develop the process of your project, and gather information you need to create your product. This isn't the type of project where you're gathering research just to meet a research requirement - you're finding information you need to create or build something of your own. The Personal Project allows you to develop your specific interests, skills and talents. The Principled Action component of the project allows you to take that one step further - you can extend your project to examine how those interests, skills and talents you possess can benefit others. Your project may not specifically involve an act of community service. But within your project - in the planning, as part of your process journal and within your reflection, you can consider how the project and product you've created can help others. Research: Collecting information about an issue, need or problem - looking at ways to reduce the environmental impact of the school or how to reduce litter in the park - and making this information to others is helping others through Research. The Principled Action portion of your project is something that you should think about and reflect on, write about in your process journal, and include in your final project reflection. The documents below will help you further develop a topic that incorporates Principled Action. The Personal Project is likely to be one of the more large-scale projects you have completed in your academic career so far. In order to have a successful, efficient experience, it's important to have a solid plan before you start, to establish a process, and set up regular checkpoints to be sure that you stay on track and are completing your goals. Your project should be manageable in terms of time. This is an opportunity to explore your interests, and to learn about or accomplish something that you want to do. Most students spend about 50 hours, including preparation and research time, during the course of the school year to complete the project. Some spend more, depending on their product, but you should choose something that is manageable for you. Another area to consider is resources - make sure that you have access to the equipment and the resources that you need. You shouldn't have to make a significant financial investment to complete your personal project. When considering a topic, think about the resources that you have available to help create your desired product. 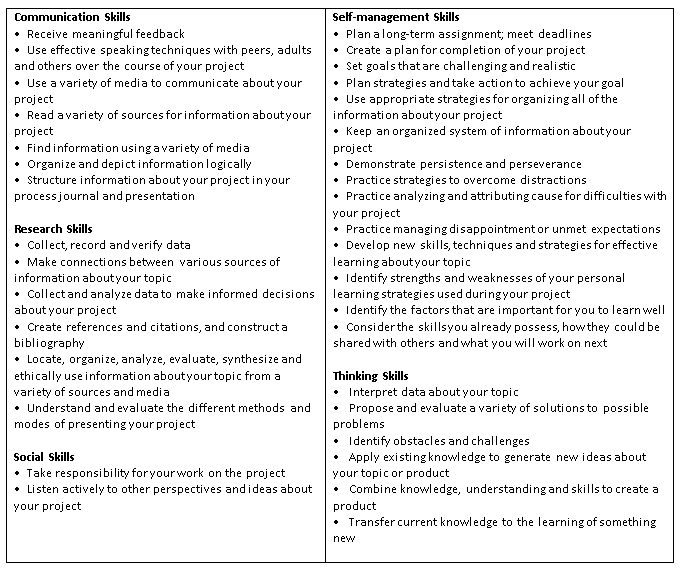 The documents below will help you plan, monitor and assess your progress as you're working on your Personal Project. Your teacher will be helping you with this process, and will go over these documents with you and help you keep to the schedules that you and the Personal Project Committee have set. All of your projects have to contain an oral presentation and a written report. You do have some options as to how to balance these two parts. Both the oral presentation and the written report can be of different lengths. The length of one part will determine the length of the other part.